There are times when Heather, Aly & I finish a book, but don’t have time to write a full, comprehensive review… or even a shorter “flashbulb” review. BUT we still want to share our thoughts with you on what we’ve been reading. That’s why every Saturday we’ll be featuring 3 “snippet” reviews — short, sweet, to-the-point reviews that we’ll try to keep to 2-7 sentences. So we hope you enjoy these!! 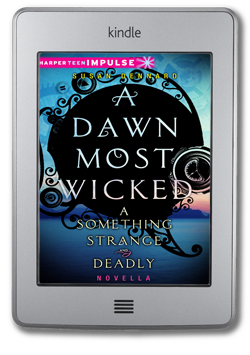 At just over 100 pages, A Dawn Most Wicked proves to be quite a meaty novella, both in size and in content. Providing an interesting perspective into the back story of Daniel Sheridan, this particular moment in his history grants a lot of insight not only into Daniel’s decision at the end of Something Strange & Deadly *shakes fist*, but also allows the reader to see just how The Spirit Hunters were formed, and Joseph, Jie, and Daniel’s first adventure together. This story takes place primarily as a flashback as Daniel visits Eleanor in the hospital in the aftermath of… spoilery stuff from the first book, and is wonderfully book-ended by present day Daniel’s thoughts and struggles as he wars with his feelings for Eleanor. His memory, the story, itself is equally compelling and page-turning — Daniel trying to outrun his dark past, loving a girl he shouldn’t, an ambitious race on the Mississippi in a steamboat haunted with terrifying ghosts. Action, adventure, romance, horror, danger and heartache all artfully rolled into a small story that’s perfectly paced and well-executed. Though it’s not necessary for understanding the larger story line of this series it does yield some interesting possible foreshadowing into aspects of A Darkness Strange & Lovely, and gives the reader a rare glimpse beneath the gruff, tough exterior of Daniel Sheridan. Character building, peeps. It’s good stuff. If you’re a fan of the series, I highly recommend this novella. I love a good Rom-Com from time to time. You know, there is just something about the feel-goody love story of guy meets girl and romantically ever after that makes me smile. This is What Happy Looks Like is just that type of book. It’s cute and funny and endearing, but in the end, it fell a little flat for me. The characters were fun and enjoyable to read, but I never really got to know them and the plot seemed a little unfinished or underdeveloped. Had I read this book before Smith’s other novel, I might have enjoyed this more fully, but The Statistical Probability of Love at First Sight was so much more fulfilling and fully developed. 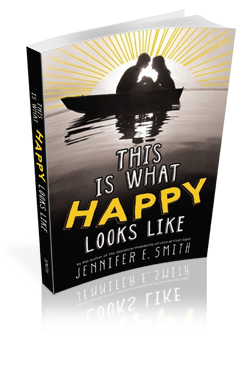 Both of Jennifer Smith’s books are on my TBR list. Thanks for sharing your thoughts, ladies! Thanks for stopping by, Rachel! I hope you get the chance to pick up Jennifer’s books at some point!